Considering that 2016 is shaping up to be the year of big superhero face-offs, it seems odd that we haven't had many PCC articles up, doesn't it? Let's get back into the swing of things with EVERYTHING you need to know about the first big hero vs. hero face-off of the year, which takes place in the second series of the Marvel/Netflix Daredevil! There are two other trailers available on Marvel's YouTube channel which focus on The Punisher and Elektra respectively. However, we're here to analyse everything we've seen so far and get you primed and ready for March 18th when Season 2 lands on Netflix worldwide. Let's crack on. Matt Murdock, Foggy Nelson and Karen Page, the trio leads from the first series return this season, played again by Charlie Cox, Elden Henson and Deborah Ann Woll respectively. The story picks up after an as-of-yet unspecified time frame from the events of the first series, with Wilson Fisk/Kingpin (Vincent D'onofrio) behind bars and Murdock being dubbed Daredevil by the local tabloids. Season 2 is said to begin with Murdock adjusting well to his new role as Daredevil, with the crime rate in Hell's Kitchen having plummeted to an all time low. There are some changes to the main trinity, however. For starters, Daredevil will be receiving a new costume that sports the iconic reflective red eyes, as well as some changes to the protective panelling of his suit, which is no doubt a redesign from Melvin Potter (Matt Gerald), the mentally challenged armourer from the first series (Who by the way is known as Gladiator in the comics). Foggy and Karen of course now know that Matt is Daredevil, with Foggy and Matt looking like they might come to blows over the actions of The Man Without Fear. Early reviews have also said that Karen's involvement in the second series is the best yet, with her taking a bigger investment into the detective work for Nelson & Murdock, as well as her part in this series big love triangle. Also returning from the first series are the 'night nurse' Claire Temple (Rosario Dawson) and Matt's once mentor and reluctant father figure Stick (Scott Glenn). In particular, the return of Stick feeds into the main plot of this series, as we'll likely see him engaged in a ninja clan turf war towards the end of the 13 episode run, but we'll touch on that in a moment. This series introduces two big Marvel characters into the MCU: Frank Castle, or the Punisher (Played by The Walking Dead's Jon Berthnal) and Elektra Natchios, who is closely related to Matt Murdock (Played by Élodie Yung). In case you don't know who either of these two important characters are, we'll quickly break down their comics origin and the Netflix versions of both of these characters. First up, The Punisher. You may know this one already, but The Punisher, real name Frank Castle, is an anti-hero from Marvel Comics who first appeared in a Spider-Man comic in 1974. The Punisher is different to many heroes in Marvel's canon in that his moral compass is... well, non-existent. Following the death of his wife and two children in a gang shoot-out in New York, the Punisher vows to end all crime he possibly can through the application of his intense special forces training, which includes guerilla tactics, marksmanship, CQC, infiltrations, demolition, explosives and and impressive and seemingly never-ending catalogue of knowledge of guns and ballistics (Including an infamous gun that shot swords and occasionally frank'd franks). Although arguably on the side of good, wishing to end crime forever, The Punisher is totally okay with fighting fire with fire, often torturing, extorting, kidnapping and murdering whoever he needs to in order to get the job done. The man is a walking one-man army who never lets his enemies go, which is why he has a very minimal list of villains in his rouges gallery. Castle has been portrayed by a number of actors including Dolph Lugdren, Thomas Jane and even Norman Reedus (in voice, anyway), but in Daredevil Season 2, Frank Castle will be played by Jon Berthnal, who most recently starred in The Wolf of Wall Street, Fury and as the infamous Shane Walsh in The Walking Dead. He seems an almost perfect fit for the character, giving off a physically and mentally imposing acting style with a hint of psychosis. In Daredevil, Frank Castle is out to end all crime in Hell's Kitchen for good, following the death of his wife and child. With his US Marine training and an unfathomably large arsenal of weapons at his disposal, Castle is showing no mercy to the grimy underbelly of Hell's Kitchen. The biggest clash though, however, will be between Daredevil and Castle, as the two will fight over their ideals, with Castle taking the stance that he is more effective at fighting crime because of his penchant for murder. Like Murdock before him, Castle will receive the moniker of 'Punisher' through his notoriety in the press, as well as don the skull logo in the later half of the series. Elektra is a highly trained assassin of Greek descent and Daredevil's on-again-off-again love interest in the Marvel comics. She first met matt Murdock at Columbia University, where the pair began dating. A year later, she was kidnapped, along with her father, who was fatally shot when Daredevil tried to rescue them both. In grief from her father's death, Elektra travelled to China to learn martial arts, with which she planned to avenge that which Daredevil couldn't save. Initially trained by both Stick's ninja group the Chaste and a group of mystical ninjas known as The Hand, she broke away from both of them in order to work alone as an assassin for hire. In her initial encounter with Daredevil, she discovered it was her old flame Matt under the red cowl, which made her contract from Kingpin difficult to fulfil. She was later killed by Bullseye, revived by The Chaste and has since fought alongside Wolverine, S.H.I.E.L.D. and The Thunderbolts (Which also included The Punisher). Following the god-awful Jennifer Garner version of the character in 2003, Elektra Natchios will be portrayed by Élodie Yung for the Netflix series, who has also starred in G.I. Joe: Retalliation and Gods of Egypt.​ Yung's version of the character follows pretty much the same notes as the comic book version, right down to her trademark choice of weapon with her twin sais. Elektra will reappear in Hell's Kitchen after mysteriously disappearing from Matt Murdocks life during university (Which has already been mentioned by Foggy Nelson in an episode from the first series). Her reappearance is directly tied to the rise of a ninja crime clan known as The Hand, as she will come to serious blows with them throughout the series. Her methods of disposal will possibly find her alternating between being on Daredevil's side, as well as against him. Again, like Castle, Elektra is not above murder, although not to the maniacal extent of The Punisher. Her reappearance will also cause trouble to Matt's love life, as she enters into an unsteady love triangle that will find Matt torn between his deadly old flame and Karen Page. Finally, I've kept mentioning them throughout this piece, but one of the big bads for this series is indeed The Hand. In the comics, The Hand are a group of evil mystical ninja who operate crime and assassination rings across the globe, whilst serving a literal demon known as The Beast. The Hand have always been a huge adversary of Daredevil, given the past conflicts between them and Stick's order of good ninja known as The Chaste. They most recently played a big part in the Shadowland storyline, where the group are forcibly taken over by Daredevil and take ruthless control of Hells Kitchen. In this story, Daredevil is possessed by The Beat, kills Bullseye and fights Spider-man, Iron Fist and The Punisher. Murdock also dies and is reincarnated in this giant story event that changed the comics version of Hell's Kitchen. For the TV show, however, we already got a taste of the hand with Nobu is the first series, who was Daredevil's adversary in one of the bloodiest battles the series gave us. This time, though, they are the main targets for both The Punisher and Elektra, as they try to impose their force over Hell's Kitchen. It's not known how much of the mysticism is present just yet, but given Madam Gao's involvement in the first series, the upcoming Iron Fist series, as well as the looming release of Doctor Strange, it's likely there will be some element of magic, perhaps toward the end of the run. The Chaste are also set to make an appearance, at least through Stick and Elektra. The full group may or may not make an appearance in this series, although scenes from Stick's episode in the first series heavily hints that they are indeed a force in the MCU. It's not clear yet how exactly Daredevil Season 2 will integrate with the wide MCU. The running theme with the Netflix shows is that they take place in their own little corner of the world, but with the success of Jessica Jones, which has also been renewed for a second season, the ties should inevitably be on their way. Early reviews suggest that Jones herself will at the very least be name dropped, which could potentially mean a trip to Alias Investigations at some point. Series runners has stated in interviews that the action will still take place entirely in Hells Kitchen, which once again tightens the action and makes the upcoming Defenders mini-series a more focused beast. When the Luke Cage series drops in October this year, we can expect much of the same; focus on the streets of Hell's Kitchen with little cross pollination with the MCU movies outside of recognising what's happening in the wider world. One of the biggest rumours circulating is the inclusion of Bullseye, arguable Daredevils biggest villain. In the comics, Bullseye is essentially Daredevil's joker, who has also been affiliated with the Dark Avengers. Rumours about the identity of the sniper at the end of the first series were flying after it's debut, with the main theory being that Bullseye would make his appearance this series. Honestly, I believe that sniper to be Frank Castle. HOWEVER, I do believe that Bullseye could be set up either for a third season or even The Defenders. Take a look at this still from one of the trailers for Season 2. The figure holding Elektra's sais doesn't resemble Elektra at all. I'd predict that this may be the final episode of the series, with Bullseye killing Elektra, much like in the comics. This may unite Daredevil and The Punisher for a future venture, bringing The Punisher into the anti-hero role we know him from, forcing the Matt/Karen pairing to happen for a potential adaptation of the Born Again story and giving way for a third Daredevil story, where Bullseye frees Kingpin and a new war for Hell's Kitchen begins against a potential 'Dark Avengers'-esque team. Avoiding all mention of the other Defenders is practically impossible at this point. Whilst I believe the rumours about the name-dropping of Jessica Jones, I'd say it's more likely that we'll start to hear more about the villains of this world. Madame Gao, The Steel Serpent and The Hand most likely have a part to play with the Iron Fist series, so I expect that we'll see more of their mystic antics toward the end of the series. I'm also expecting the villains for The Defenders to begin their inception from here. Perhaps that involves the reappearance of Kingpin? Perhaps it doesn't. Who knows. The world building it likely to continue as well. We know that the Roxxon Corporation will have a part to play in this movie, so they'll be further referenced. 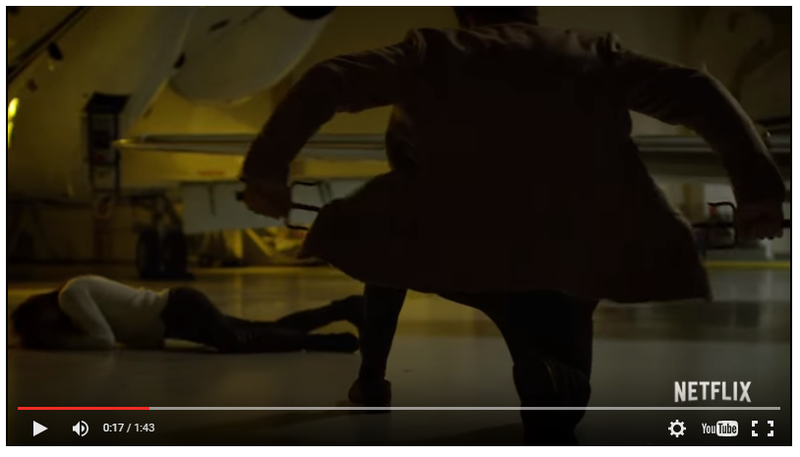 I'm also willing to bet that we'll hear a name drop of K'un L'un by the end of the series, as well as mention of either Rand Oil and Chemicals or Rand-Meachum Incorporated, depending on how far the Rand property will advance now that we know that Iron Fist is to be played by Finn Jones of Game of Thrones fame. Contrary to most people opinions, I don't think Civil War will have an impact on the series. Whilst there is tension about masked vigilantes, it's not reached fever pitch at the start of season 2. In fact, I think the OPPOSITE thing will happen. Perhaps Frank Castle's actions, Matt Murdock's retaliation or even the The Hands invasion will be referenced in Captain America: Civil War alongside the New York, Washington and Sokovia incidents. Again, dispelling what a lot of people are hoping for, I really don't see Peter Parker/Spider-Man (Tom Holland) showing up or getting name dropped or anything like that. Again, I think it's more likely that the first new Spider-Man solo movie will reference how dangerous New York is coming between full scale alien invasions and a dude with a crew cut murdering countless people. Again, this is all conjecture. I wasn't 100% correct with my speculations about Jessica Jones, although given that we're getting closer to The Defenders and Infinity War, the mixing pot that is the MCU could begin to become a lot more inclusive and cross-over happy in the coming years. However, regardless of it's integration with the upcoming Civil War and the MCU movies at large, It's still a good time to be a Marvel fan. We wait with baited breath. Marvel's Daredevil Season 2 will arrive on Netflix worldwide on Friday 18th March at 7am GMT. All 13 episodes will be available for streaming. Check back in the coming days for a Pop Culture Club series review.